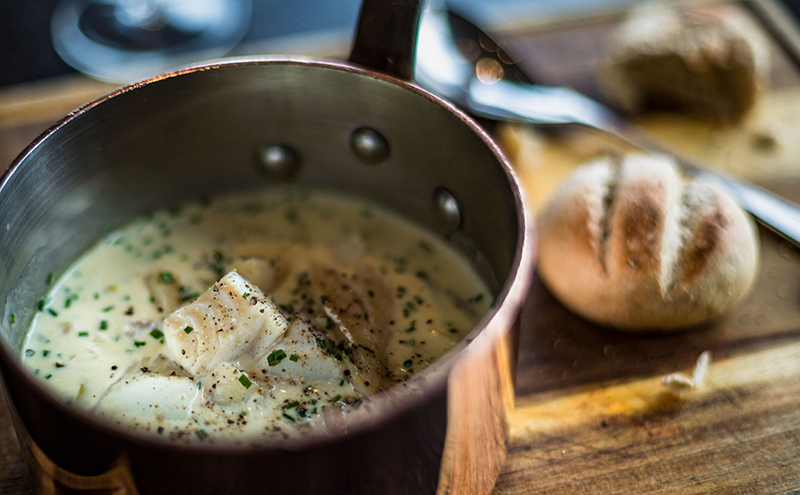 In a shallow pan, poach the haddock in the milk for six to eight minutes. When cooked, remove the fish from the milk and set aside. Reserve the milk. Sweat the onions in the butter until the onions are soft but not coloured. Add the diced potato and cook for a further five minutes, add the flour and stir the flour until fully mixed. Add the reserved milk to the pan, bring to a boil and simmer until the potatoes are cooked through. Flake the haddock and return to the pan, finish with sliced leek.